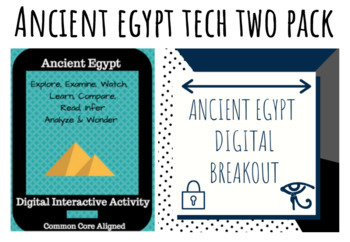 This product includes an Ancient Egypt Digital Breakout and Hyperdoc. Items also sold separately. 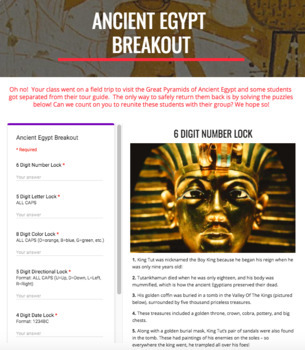 Looking for a digital breakout covering Ancient Egypt? If so, then this is the document for you! All you need is connection to the internet! This breakout is on a Google site. Oh no! Your class went on a field trip to visit the Great Pyramids of Ancient Egypt and some students got separated from their tour guide. The only way to safely return them back is by solving the puzzles below! Can we count on you to reunite these students with their group? We hope so! You may also be interested in my Early Humans Breakout, Mesopotamia Breakout, Ancient China Breakout, Ancient India Breakout, Ancient Rome, or Ancient Greece Breakout. Also a part of my Ancient Egypt Tech Bundle. 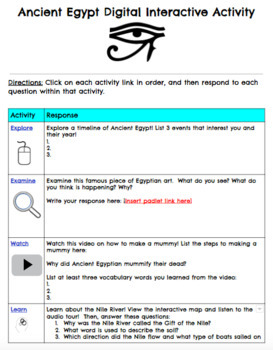 Are you looking for a way to make a topic more engaging, technological, and interactive? Well, then this is the product for you! 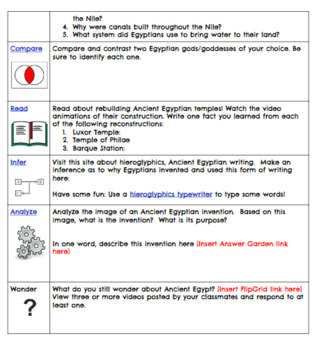 100% digital, this doc can be used to introduce or reinforce the study of Ancient Egypt.